Barbara understands the despair experienced when a child rebels. Here she'll walk you gently through a revitalising program to a hope-filled start. Her enthusiasm, humorous anecdotes and poignant reflections will encourage you to trust in God. 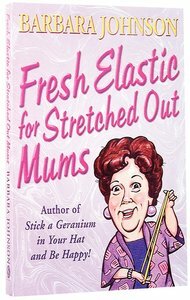 About "Fresh Elastic For Stretched Out Mums"
Barbara Johnson, known as "the Geranium Lady" sold more than five million books, including Splashes of Joy in the Cesspools of Life, Living Somewhere Between Estrogen and Death, and Stick a Geranium in Your Hat and Be Happy and her latest book Humour Me, I'm Over the Hill, part of her more recent, Humour Me series. In 2005 she was awarded the prestigious Lifetime Achievement Award by the Evangelical Christian Publishers Association. Barbara and her husband served hurting families through their non-profit "Spatula Ministries" and as a popular "Woman of Faith" conference speaker she delivered comforting, humour-filled messages across America. Barbara died in 2007 and is survived by her sons David and Dean, former daughter-in-law Shannon, and two grandchildren, Kandee and Tiffany.- Publisher.